One of the easiest ways we can incorporate sustainable living into our everyday lives is by shopping locally. Keeping our dollars in our local economy means good things for our community. Your dollar is your vote! The Elf Fair (Carrboro) and The Patchwork Market (Durham) is making it easier than ever to do just that. 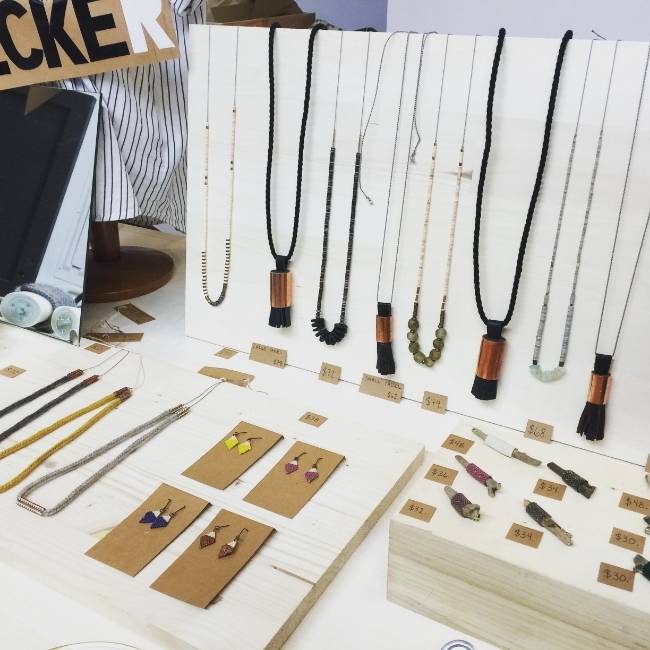 We caught up with the very savvy and talented Ryan-Ashely Anderson of Smart and Becker at the Elf Fair. Her jewelry is made with repurposed leather and up-cycled copper. Stylish, chic, and well made, they are versatile pieces you can dress up or down. For me, shopping local markets is a much more meaningful way to find gifts for loved ones. You're: investing locally; impacting globally; connecting with community; reducing waste; reducing carbon emissions; and not contributing to labor abuse. Also found at The Patchwork Market was The Noble Woodsman out of Raleigh, NC. His craft? Restoring vintage and found axes, mixing handmade soaps and beard oils, and having a great time. As I make my way through December, I'm more aware than ever of all the opportunities to waste. Too much food, over zealous packaging, bows, and decorations. My mission? To trim the waste. And when we can cut down, we can keep more dough rightfully where it should be - in our pockets! When I do spend money this year, I'm committed to choosing the most sustainable option. It's local, it contributes directly to our area, and is repurposing objects that could otherwise become trash. I urge you to join me in the waste trimming - what are some ways your family reduces waste over the holidays and keeps the spirit alive? Please share your stories!